While I was in the whirlwind of excitement that was Glasgow a couple of weeks ago I purchased a bit of cloth for myself. Just before I got the train and with a book heavy rucksack on my back, handbag strapped across me, cloth bag on my shoulder full of yarn, cloth bag in one hand full of charity shopping, woven plastic shopping basket full of cheese in the other and a brand spanking new, still in its original packaging Aloma pure wool blanket from the sixties under my arm - I couldn't leave it, I thought I'd just pop in to Remnant King. 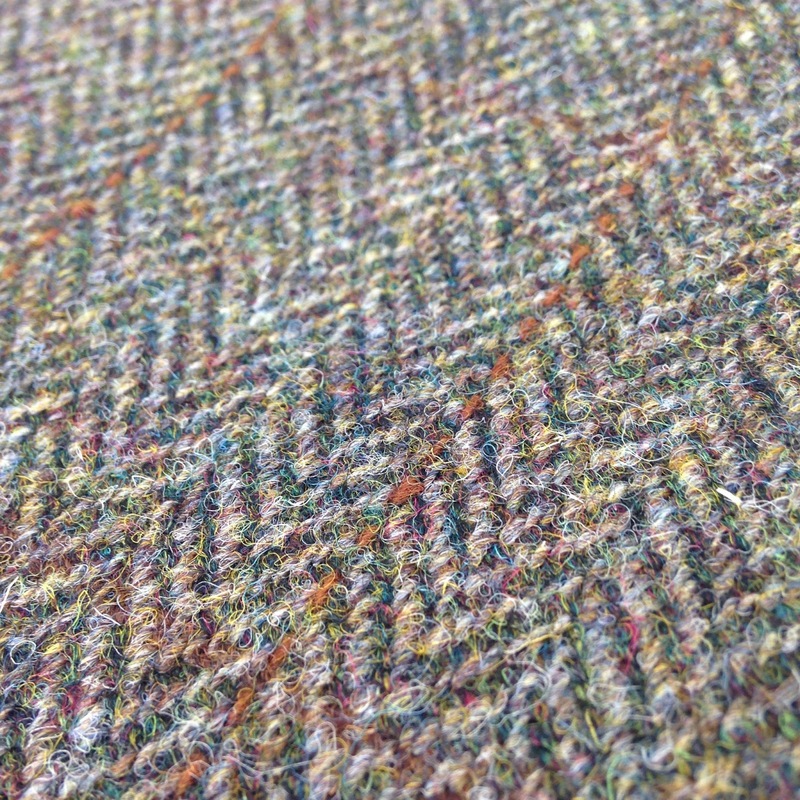 This Harris Tweed will forever remind me not to squat down and rummage through bargain fabric whilst fully laden! I am thinking a pinafore type dress for winter, I don't think I'll use the label that comes with it on a dress but I might use it on a tweed and leather tote. The leather shopping is another story. 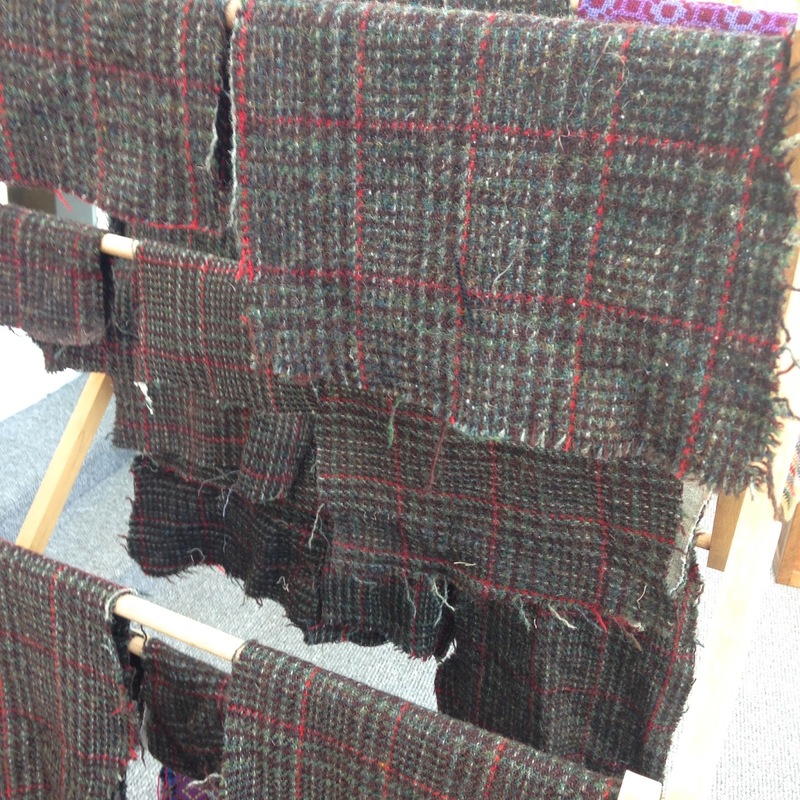 My waiting to be embroidered Harris Tweed jacket collection keeps on growing, it takes a fair amount of time to let them soak in a bucket and keep rinsing and soaking until the water is clear and they are refreshed, then air dry them and then fix any problem areas. This one I purchased because of the patten but I don't expect ever to come across a gentleman or lady who will fit such a slim and extremely long jacket. A.H.Martin Esq. must certainly have stood out from the crowd in 1972. It's been fully deconstructed and soaked and is now waiting for the next adventure. Hi I just found your blog and this entry on Harris Tweed caught my eye. I also love charity shops or what we call back home in NY Thrift Shopping. I'll never forget the time I went to a favorite Salvation Army and they had a $1 to fill a bag deal. 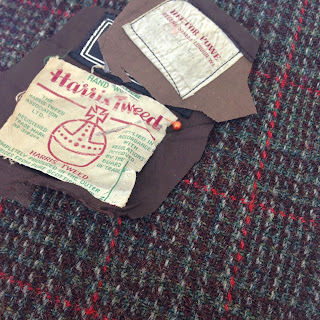 I found a Harris Tweed jacket and other things! I Just love wool and mostly have been hording wool sweaters and shrinking them to make into something else (I hope). I've gotten into felting so even wool cloth isn't safe around me anymore! 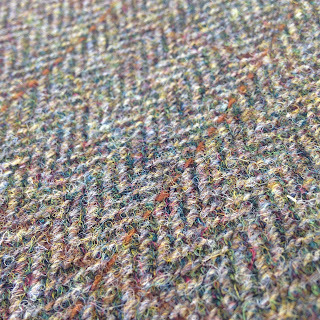 I just shrank a wool jacket and now want to deconstruct it but it's puckered so I think it needs a good steam ironing. I was thinking I could cut it up to use for Needle Fetled brooches? Just wanted to say I never thought of soaking my garments first. Do you do this then let them dry, then take them apart after?